Articles that are opened in InCopy. Saving and closing these articles is done by Smart Connection for InCopy. For more information, see Closing or saving an article using Smart Connection 9 for InCopy. Articles that are opened in an external application such as Word or Pages. Saving and closing these articles is done through the Checked Out tab in Content Station. For more information, see Opening, saving and closing files with Content Station 9. InCopy articles. This is the default type of article used by Content Station. It contains formatting information and may contain layout design information. It is typically edited within Content Station by using the Multi-Channel Text Editor (although Content Station can also be configured so that these files are opened in InCopy). Note: The InCopy articles need to have been created in Adobe versions CS5, CS6 or CC; articles that have been created in CS4 can only be opened in the Multi-Channel Text Editor when the Enterprise Server plug-in “Content Station CS4 Article Conversion” is activated. Plain-text articles. These contain no formatting or layout design information. They are edited in the Plain-Text Editor of Content Station. HTML articles. These contain formatting information but no layout design information. They are edited in the HTML Text Editor of Content Station. Note: When the Enterprise Server plug-in 'Content Station CS4 Article Conversion' is activated, these articles are converted to InCopy articles and are opened in the Multi-Channel Text Editor. InCopy article templates. These articles cannot be opened in Content Station and can only be edited in InCopy. All other article types such as those for Word, Pages, and so on. These articles cannot be opened in Content Station but can be opened outside of Content Station in their respective applications. 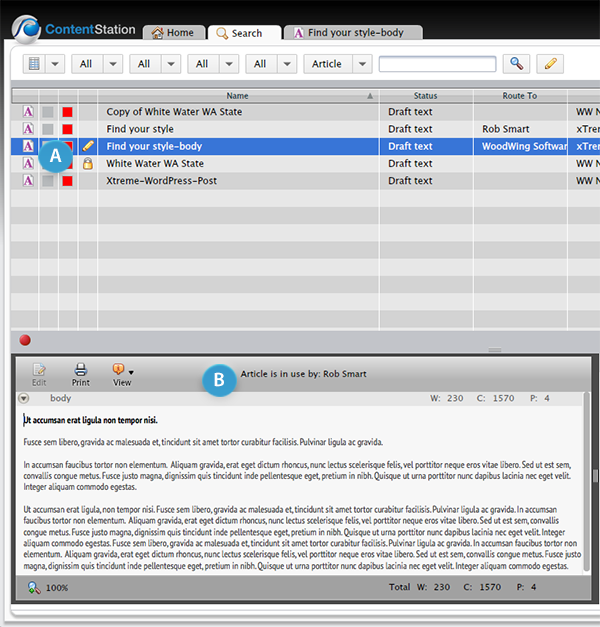 For information, see Opening, saving and closing files with Content Station 9. When using Content Station versions older than 9.4.4 or when using Content Station 9.5.x: these articles cannot be opened in Content Station and can only be edited in InDesign or InCopy. A graphic component is a frame that only contains an image. This is typically created by placing an image in InDesign or InCopy and turning it into an article component. Article components that contain an inline image are not treated as graphic components and can therefore be edited at all times. There are various ways of opening an article in Content Station and various methods of how an article is opened. Double-clicking an article outside of a Dossier. Selecting an article outside of a Dossier, right-clicking it and choosing 'Open' or 'Open Read-Only'. Selecting an article outside of a Dossier and choosing File > Open > Open or File > Open > Read-Only. Double-clicking an article in a Dossier. Selecting an article in a Dossier, right-clicking it and choosing 'Open' or 'Open Read-Only'. Selecting an article in a Dossier and choosing File > Open > Open or File > Open > Read-Only. Note: Each opened article is added to the Opened Articles pane where it can be accessed by clicking it. Selecting an article, right-clicking it and choosing 'Open in New Window' or 'Open Read-Only in New Window'. Selecting an article and choosing File > Open > New Window or File > Open > Read-Only in New Window. 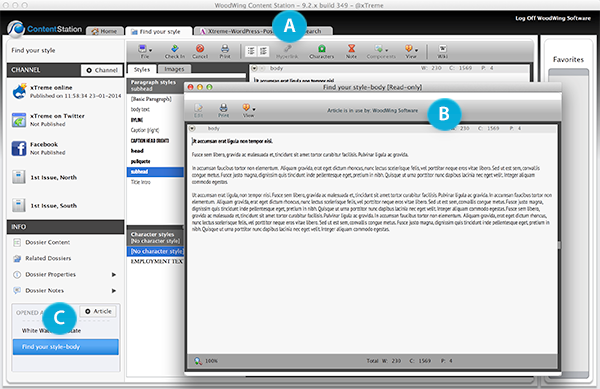 Figure: Articles opened in different ways: in a new tab (A), in a new window (B) and in a Dossier (C). The file is checked out of the system. During this state, other users are prevented from editing the file. An icon appears in the 'In Use By' column of the Document pane for the article: a yellow pencil for you as the user who has checked out the file, a yellow padlock for all other users. (InCopy articles only) When selecting the article, the name of the user who has the article open for editing is displayed in the Preview pane. Figure: You can tell that an article is checked-out by the icons in the Document pane (A) and the name of the user who has checked-out the article when previewing that article (B). During this process, a new version of the article is saved to the Enterprise system. Saved article versions can be viewed and restored by accessing the Show Versions window (File > Show Versions...). Note: For more information see Viewing and restoring file versions using Content Station 9. Note: Enterprise can also be configured to have all minor versions removed as soon as the article is saved to a new Workflow Status. You could therefore see no versions listed when starting to work on an article that has just been moved to a new Workflow Status. Note: This option is not available for HTML articles and plain-text articles. Step 2. Enter the name of the new article and define where in the system it needs to be stored. The currently opened article is checked-in and closed. It is now available for other users to edit it. The newly created article is opened for editing. When you are finished working on the article it needs to be checked-in. This saves the made changes to Enterprise and makes the article available for others to edit. Using the Check In dialog box. Use this method when the file name or any of the article properties need to be changed. Not using the Check In dialog box. (Requires Content Station 9.2.1 or higher) Use this method when you know that the name or properties of the article do not need to be changed. This method is known as a 'silent check-in' because it does not display the Check In dialog box. Note: For Content Station 9.0 or 9.1, the key combination is Cmd/Ctrl+K. Step 2. (Optional) Change the name of the article and the location where in the system it needs to be stored. The article is checked-in and closed. It is now available for other users to edit it. Info: This feature requires Content Station version 9.2.1 or higher. In this method, the Check In dialog box is not displayed, thereby saving you the time of bringing up the dialog box and having to click the OK button. Tip: Use this method when you know that none of the original settings need to be changed. This can especially save time when multiple files need to be checked-in. Note: In Content Station 9.8.9 and higher, the content of the Comments box is cleared during a silent Check In. By checking-in the article. See Checking-in the article and closing it above. By creating a copy of the article and closing the article that was worked on. See Saving the changes as a new version and continue editing the article above. By closing the article without saving any last-made changes (known as an 'Abort Check-out). See below. 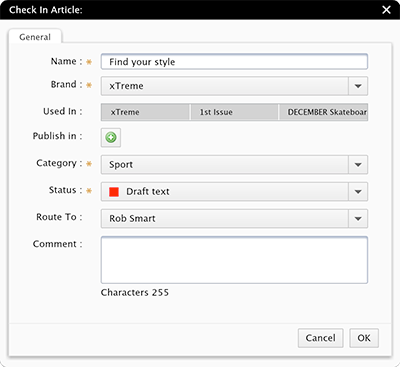 Use the Abort Check-out feature to close the article without saving any last-made changes. Note: Any versions that were saved after checking-out the article are maintained in the system. Example: You have checked-out an image, saved an intermediate version of it, and continued working on the image. When performing an Abort Check-out, the last made changes are discarded but the previously saved version is kept in the system. This method is typically used when opening an article by mistake, quickly checking the content of the article without having to work on it, or realizing that the article does not need to be edited. (Only when an article is opened in a new Tab or in a separate window) Close the Tab or window, for instance by using the keyboard combination Cmd+W / Ctrl+W. (Multi-Channel Text Editor only) Hover the mouse pointer over the name of the article in the Opened Articles pane of a Dossier and click the X-icon. Click the Abort Check Out button in the toolbar (not available in the Multi-Channel Text Editor when the article is edited within a Dossier). Note: If in any of these scenarios the file has been edited, you will be asked to confirm that you want to discard the changes; if no changes were made, the article is automatically closed. 9 March 2017: Added information about the Comments box being cleared when performing a silent check-in for version 9.8.9 or higher.